Before they had a guy who put out fires, the Joe team had a guy who started them. Blowtorch is thoroughly familiar with all military incendiary devices and flame projection equipment. To Blowtorch, the use of fire in combat is a science that predates the bow and arrow. He's a qualified expert in the M-7 flamethrower, M-16 rifle, and M-1911A1 auto pistol. He also has an annoying habit of checking every smoke detector he sees. "Blowtorch can't sleep unless he's near a smoke detector. Cigarette smoke drives him bananas. He always sits near the exit in movietheaters and refuses to live anywhere where he can't safely jump out the windows. This is not irrational to him. These are actions based on intimate knowledge." 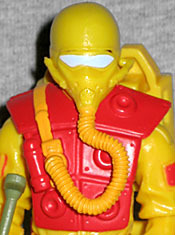 Despite being one of the earliest GI Joe figures, Blowtorch has never really gotten a lot of respect. He only appeared on 22 episodes of the cartoon, and half as many issues of the comic - including the DDP run! If not for that BTR version of him, we wouldn't even have had a proper update in 25 years. This figure is based on the new Arctic Snake-Eyes, though with so many changes that he can barely be recognized. The padding on his chest is a separate piece, and his arms and lower legs are new. Blowtorch's head is new, and Mr. Timothy Hanrahan has been given quite a bit of personality - far more than he got for being the full-on stereotypical "faith an' begorrah!" Irish potato-eater on the cartoon. Rather than the stern fatherly face of the G1 toy or the rather plain face from G2, this G3 version has a small grin, suggesting he's having fun on his assignment. He's still got the plastered down haircut as the 1984 version. In addition to being the first figure to break the color barrier (so to speak) with the Joe Team, the 1984 Blowtorch was the first to feeature a removable facemask. This figure keeps that alive, but does a much better job of it. The helmet fits tightly on his head, which not all the G3 figures can claim. The mask, rather than having a strap that wraps all the way around the head, has two small pegs that fit into the sides of the helmet. The mask is just a bit too wide to have both pegs tightly in place at once, but it will still stay on well, even with the (thick, molded) air hose plugged into his chest. There's a tab to tuck into the brim of the helmet, and the goggles are painted blue. Blowtorch's backpack fuel cannister has gotten an upgrade, as well. At a glance it looks the same - in fact, under close inspection it looks the same, too. But there's a large panel on the left that can be removed, and a slot on the side where you can plug in the flamethrower for storage. 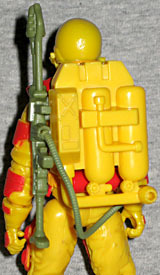 Accordingly, the flamethrower has a matching tab on the side, and the hose connecting the flamethrower to the backpack is a separate, flexible piece, rather than a molded part of the weapon. A few construction notes that apply to my figure, but may or may not apply to yours: His right leg is noticably longer than his left, so unless you pose him with a slight bend in his knee, he's always be leaning to the side. The discrepency is found in the shins, because he's even all the way down to the knees. Plus, my Blowtorch has two right forearms, but thankfully, it doesn't really screw with his articulation much; the left elbow moves just as far as it seems like it should. That's not something that would be obvious in the packaging, and even if it were, Blowtorch is the shortpack of this series, so good luck seeing one of him, let alone a second to compare. Blowtorch is a figure that really shows off the best aspects of what the Generation 3 line can achieve: a handy update of an old classic, made from re-used parts but still looking entirely fresh, and with small updates made to the paint and accessories in the interest of making a better toy. This is terrific work, and if you're lucky enough to find one, I'd say get him.